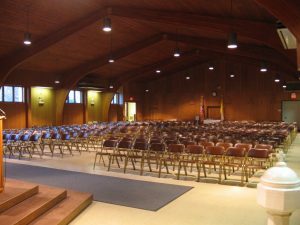 View of the original worship space, looking south. 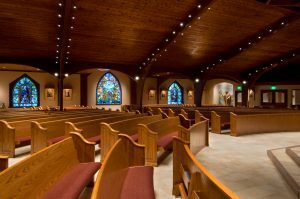 View of expanded and renovated worship space, looking south. We felt that it was very important that the arrangement of the worship space communicate this very important value of the parish community. 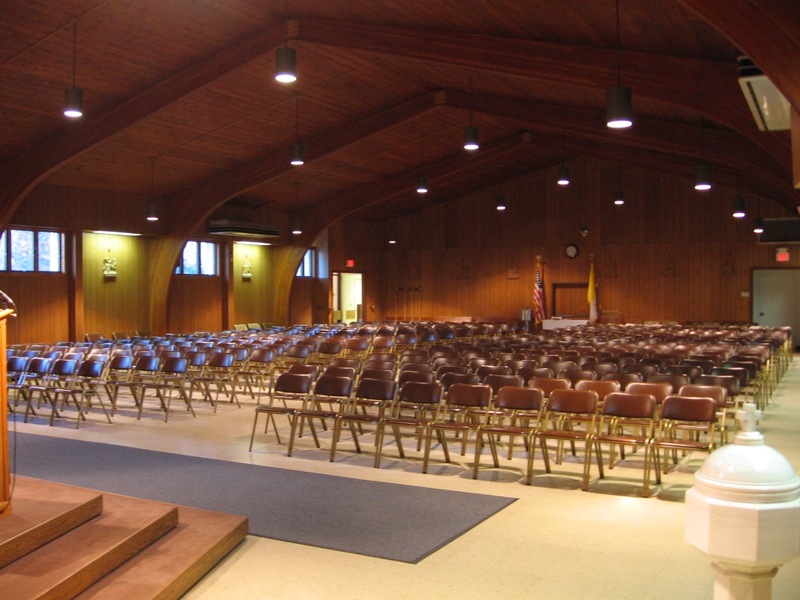 By creating a small addition to the front of the building and reorienting the worship space, we were able to reduce the distance between the celebrant and the last row from approximately seventy feet to fifty feet while increasing the seating capacity from 310 to 400. More importantly, though, the new configuration allows worshipers to be within the peripheral vision of each other, thereby reinforcing the feeling of community that already exists. A new chapel for Children’s Liturgy of the Word, with a child-height window depicting the Holy Spirit, provides a special place for the children to gather and worship. 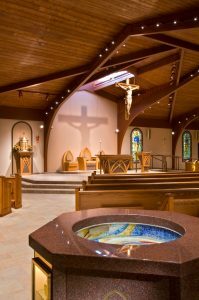 The renovation of the existing worship space completely transformed the space from its previous cold, dark character to one that is warm, inviting and of the highest quality. Stained glass windows salvaged from the chapel where the parishioners first met were incorporated into new stained glass windows in the addition. Other new stained glass windows include symbols of the Holy Spirit and the Eucharist. New lighting highlights the existing wood ceiling but all other interior finishes were replaced with new, quality finishes. 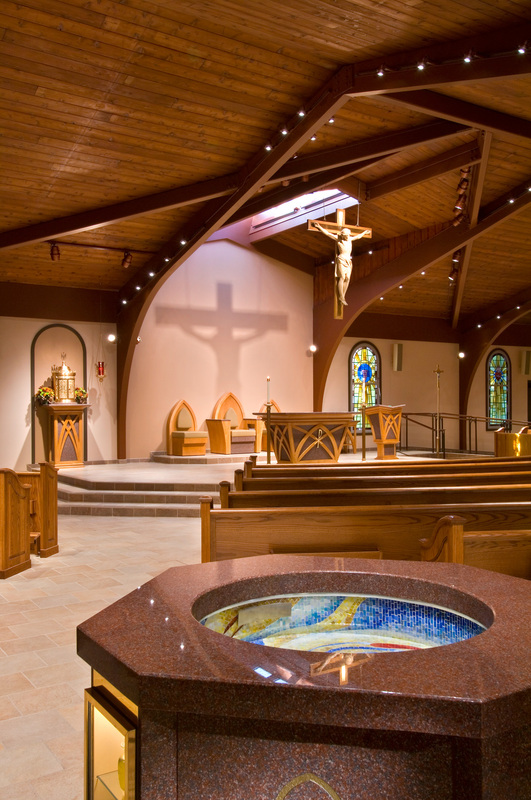 A new gable roof with ridge skylight was inserted over the altar to allow more light to enter the space and to create more of a focal point at the altar. 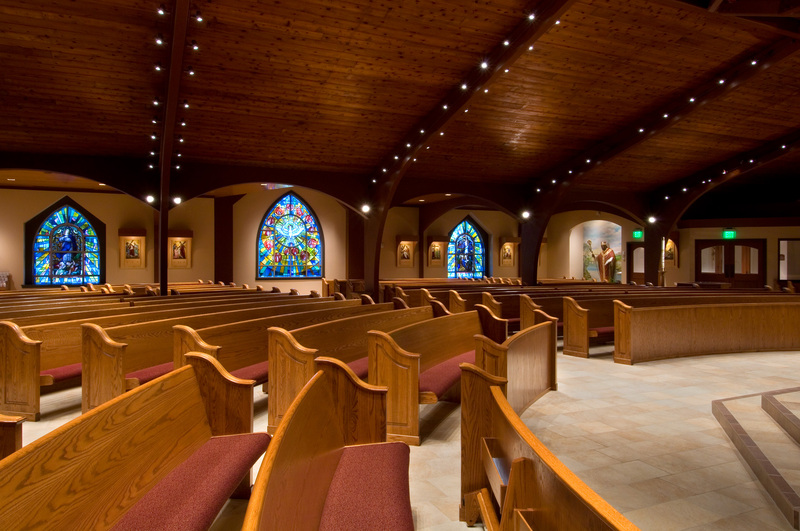 New liturgical furnishings were custom-designed and built to be sympathetic with the renovated worship space. Original mosaic artwork and carved wood statues helped to carry on the rich tradition of Catholic art. Architectural Design by Foresight Architects. All photographs by Randall Perry Photography.